As a content strategist, much of my work centers heavily around search engine optimization. Our clients rely on our team to provide content recommendations that are backed by sound analytical data and driven by results. That’s why one of my first goals upon joining the Southern Web team was to become certified in Google Analytics. 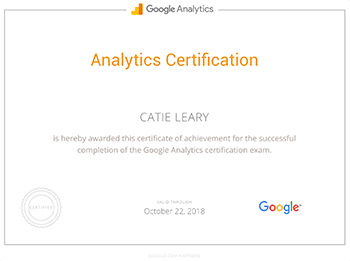 Of course, the fine folks at Google don’t hand out certifications to just anyone — you have to earn it by taking the Google Analytics IQ exam, a 90-minute online exam comprised of 70 questions covering everything you need to know to leverage the service’s countless features and tools effectively. And to pass that exam, you have to put in some serious study time. Truthfully, I was kind of intimidated when I first start preparing for the exam. The prospect of failing was a major source of anxiety for me, so you can imagine my relief when I took the exam and passed with a 94% score! Google Analytics for Beginners, which walks through the essential features and concepts of Google Analytics — from setting up accounts and implementing trackings codes to analyzing basic reports and setting goals. Advanced Google Analytics, which takes a deep dive into more complex concepts, features, and tools. The courses feature instructional videos, guided interface walkthroughs, and assessments at the end of each section. The courses underwent a revamp in March 2017 — so they’re now easier to use than ever before. There are also additional resources at the end of each lesson if you want to gain a more in-depth understanding of a particular topic. You need to complete both courses, as the GA IQ exam draws questions from each of them. Depending on how often you pause and replay certain sections, you can expect it to take at least 8 hours to get through all the material. Everyone has a different learning style, but I personally found that the best way for me to retain information was to take an absurd amount of handwritten notes while making my way through the exam study guide. Not only did I retain information effectively this way, but I also had plenty of notes to refer to while taking the exam. Remember to label each page of notes with the corresponding study guide section number so that you can easily refer to it. Another challenge of studying for the exam is simply making the time. Trying to earn this certification on top of your daily job responsibilities can be a bit overwhelming, so it helps to establish blocks of uninterrupted time to devote to studying. In my case, I scheduled dedicated blocks of study time (typically 3-5 hours) every Sunday afternoon for an entire month. If I hadn’t done that, I’d probably still be procrastinating. Make a commitment to yourself, and then follow through! My final word of advice is to CHILL. If you’re someone who starts to feel queasy at the mere mention of taking a test, then it’s likely tempting to build up this test in your mind as more complicated than it is. I realize it’s easy for me to say that now that I’ve passed the test, but as long as you take the time to go through the study guides and jot down notes, you will be just fine. Even if you’re not feeling very confident when you take the test, take heart in knowing that not only is it an open book, but it’s also possible to pause the exam if you need some time to ruminate on particularly challenging questions. And hey, even if you are unable to pass it on your first try, don’t sweat it. You can retake the exam after seven days, so use that stretch of time to review the concepts with which you struggled. By following these common sense study tips, you’ll be Google Analytics certified in no time! Follow Southern Web on Twitter and Facebook for more industry insights, or learn more about how we leverage the power of web analytics in our digital marketing campaigns.